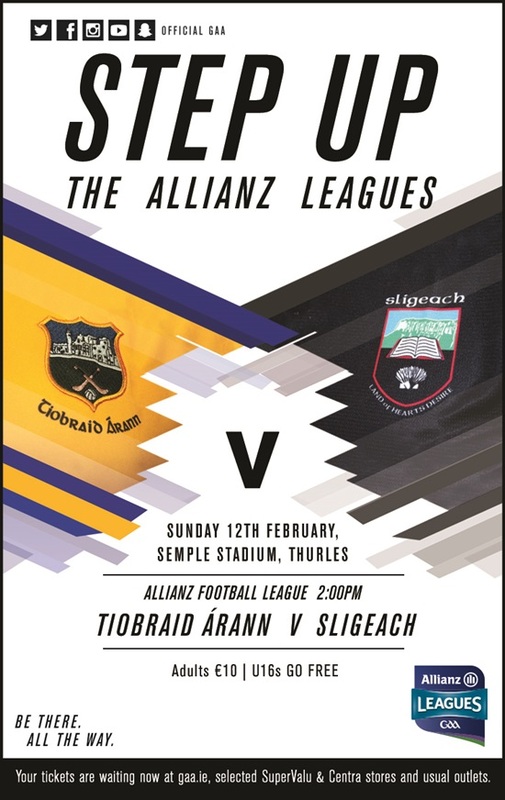 Sligo defeated Tipperary by 2-14 to 1-16 in Round 2 of the Allianz Football League Division 3 on Sunday February 12th at Semple Stadium Thurles. A costly afternoon at Semple Stadium saw Tipperary lose Jimmy Feehan to a red card, Philip Austin to injury and two precious points in the race for promotion from Division 3. Sligo were 10 points up during the second-half but had to hang on to win by the minimum against the 14 men in front of 749 spectators in Thurles. Kyle Cawley and Niall Murphy scored crucial first- half goals for Sligo, who made it three points from a possible four following a draw with Armagh. Earlier, in the 45th minute, Feehan mistimed a shoulder on goalscorer Murphy and referee Niall Ward reached for a second yellow card for the Killenaule man. Despite trailing 0-10 to 2-14 with 15 minutes left, Tipp could have taken something from the game. Michael Quinlivan sent a 76th-minute free wide before Robbie Kiely’s thunderous drive from distance was deflected out for a ’45 byr Neil Ewing. In the eighth minute of stoppage time, O’Halloran drifted his ’45 over the crossbar and when play restarted, Ward blew for full-time. At the break, Sligo were 2-9 to 0-8 clear – Cawley netting in the ninth minute before Murphy struck eight minutes before the break. Tipp improved in the second half and after Austin missed a big goal chance, All-Star Michael Quinlivan finished well with seven minutes left to provide the hosts with a lift. Tipperary manager Liam Kearns said: “We’re disappointed, it didn’t go for us today – we got caught with sucker goals and getting the man sent off was a real body blow. Scorers for Sligo: Kyle Cawley 1-2, N Murphy 1-1, A Marren 0-4 (2f), M Breheny 0-3 (2f), G O’Kelly-Lynch 0-2, A Devaney (45) & C Davey 0-1. Scorers for Tipperary: M Quinlivan 1-2 (0-2f), C Sweeney 0-5 (3f), K O’Halloran 0-4 (3f, 1 45), A Moloney 0-2, B Fox, P Austin & L Boland 0-1 each. SLIGO: A Devaney; R Donavan, K McDonnell, N Gaughan; Keelan Cawley, N Ewing, G O’Kelly-Lynch; P O’Connor, A McIntyre; C Davey, M Breheny, J Kelly; Kyle Cawley, A Marren, N Murphy. Subs: E McHugh for Keelan Cawley (inj., 32), S Gilmartin for O’Connor (60), S Coen for Murphy (62), J Hynes for Davey (70+4), E Connolly for Donavan (inj., 70+8). the Tipperary Senior football team to play Sligo in Round 2 of the Allianz Football League Division 3 encounter in Semple Stadium on Sunday next, February 12th at 2pm has also been announced by manager Liam Kearns. Following on in positive fashion, Kearns keeps faith in the same team that lined out the last day as Tipp bid for a second home win in as many games. This entry was posted on Sunday, February 12th, 2017 at 12:00 am and is filed under events, News. You can follow any responses to this entry through the RSS 2.0 feed. Both comments and pings are currently closed. Kerry defeated Laois by 3-14 to 0-19 in Round 1 of the Allianz Hurling League Division 1B on Sunday February 12th at Austin Stack Park Tralee. Kerry pulled off a remarkable comeback against Laois with a double goal strike in the 60th minute helping them overturn a nine-point half time deficit to earn what could be a hugely significant win this afternoon. Trailing for most of a contest against a sharper Laois team at a very cold Austin Stack Park, three second half goals gave new Kerry manager Fintan O’Connor a crucial win in front of a small crowd. Padraig Boyle’s 37th minute penalty goal made a small inroad into Kerry’s 0-4 to 0-13 half time deficit but the Kingdom still trailed by six points in the 60th minute. Boyle pulled first on a loose ball to raise his and Kerry’s second green flag, and when Colum Harty found the Laois net 50 seconds later Kerry, somehow, found themselves level. Mikey Boyle’s point two minutes later gave Kerry the lead for the first time, and with Laois left reeling, the home side closed out the comeback with late scores from the Boyle brothers, Shane Nolan (free), Harty and Paudie O’Connor. The first half was a free-ridden affair largely reduced to a free taking contest between Stephen Maher and Shane Nolan, with the former winning that contest by six points to three, as Laois dominated much of the half. Nolan’s frees had kept the home side in touch, but a few errant strikes meant Kerry trailed 0-4 to 0-13 at the break, with the impressive Willie Dunphy scoring four points from play for Laois in the first half. Kerry had played against a stiff breeze in that first half, but it still looked like they had left themselves too much to do. Padraig Boyle won the 37th minute penalty he converted, but trailing 1-9 to 0-18 after 60 minutes Kerry were staring at an opening day defeat. Then came that double goal strike, however, and geed up by a small, but vociferous home support Kerry kicked on and found their scoring touch to five off the last six points to hand Kerry an important win over their former boss Eamonn Kelly. Scorers for Laois: S Maher 0-11 (11fs), W Dunphy 0-4, P Whelan 0-1, B Conroy 0-1, N Foyle 0-1, PJ Scully 0-1 (sl). Subs: K Carmody for J Conway (53), J O’Connor for J Goulding (70). Subs: PJ Scully for C Taylor (57), E Lyons for P Whelan (60), S Downey for R Mullaney (63), C Healy for N Foyle (66). Clare maintained their unbeaten record in Division 2 of the Allianz Football League, defeating visitors Down at an extremely cold Cusack Park in Ennis yesterday. Having drawn away to Derry a week earlier, Colm Collins’ charges built the foundation for this victory in the opening half, going in at the half 2-7 to 0-3 in front. Collins said after the game: “We didn’t put away the chances at times but they will go in eventually, we’ve just got to keep making them”. He was referring to goal chances especially, as Down keeper Marc Reid pulled off a number of crucial saves throughout the tie. Reid was alert inside 20 seconds to deny David Tubridy. But two minutes later Keelan Sexton got through for Clare and toe-poked to the net, for the opening score of the tie. In a one-sided first half, the Banner dominated and grabbed a second goal in injury time through David Tubridy. The full-forward had missed another chance minutes earlier, when he shot over the bar with the goal at his mercy. Reid also made an important interception on 16 minutes, when he denied Eoin Cleary yet another goalscoring opportunity. Clare were at least raining white flags and tagged on three further points after the break through Cleary (twice) and Jamie Malone, inside five minutes. Though they managed just one more score from then until the end, there was very little danger of them losing this clash, having done enough in the opening half. “It was a disappointing result for us,” reflected Down manager Eamonn Burns. Scorers for Clare: D Tubridy (1-3); E Cleary (0-4, 1 free); K Sexton (1-0); J Malone (0-3); S Collins (0-1). Scorers for Down: C Magee (0-3, 2 frees); R Johnston (0-2); B O’Hagan (0-2 1 free); D O’Hagan, A Carr, S Millar, P Havern (0-1 each). CLARE: Joe Hayes, John Hayes, K Harnett, M McMahon, L Markham, G Kelly, D Ryan, G Brennan (Capt. ), C Russell, S Collins, K Sexton, S Brennan E Cleary, D Tubridy, J Malone. Subs for Clare: C O’Connor for G Brennan (44), D Nagle for John Hayes (49), C O’Dea for Tubridy (54), P Lillis for Ryan (58), D Egan for Malone (64), G O’Brien for Collins (67). DOWN: M Reid, R McAleenan, G McGovern, D O’Hagan (Capt. ), C McGovern, N Donnelly, C Mooney, A Carr, J Flynn, J Murphy, C Magee, S Millar, A Davidson, P Havern, B O’Hagen. Subs for Down: D O’Hanlon for C McGovern (h/t), C McGinn for Davidson (h/t), K McKernan for Havern (44), R Johnston for G McGovern (54), J Johnston for B O’Hagan (61), P Turley Flynn (64). Wexford defeated Limerick by 1-14 to 0-14 in Round 1 of the Allianz Hurling League Division 1B on Sunday February 12th at Innovate Wexford Park. A tally of 1-8 from Conor McDonald guided the purple-and-gold to a crucial victory over Limerick in the opening-round of the Allianz Hurling league on Sunday afternoon. With the wind at their backs Limerick enjoyed a six-point advantage at half-time. However, Wexford’s big guns rose to the challenge. Rejuvenated by a couple of key substitutions, Wexford held the visitors scoreless for almost 20 minutes. Conor McDonald’s 62nd minute goal stretched Wexford’s lead to four, which was enough to hold off the challenge provided by John Kiely’s Limerick. Wexford started with a four-man rotating attack. Paul Morris, Lee Chin, Barry Carton and Conor McDonald alternated, with one taking the full-forward spot while the remaining trio took up centre-forward line positions. As a result, David Redmond and Aidan Nolan worked doggedly in defence. However, Limerick tore through on numerous occasions in the first half. Cian Lynch and Peter Casey directed matters in attack, putting pressure on the Wexford defence. Points from both Lynch and Casey as well as some eye-catching Seamus Hickey and Graeme Mulcahy efforts contributed to Limerick’s 13th minute lead of seven-points-to-two. Although a Conor McDonald brace offered hope for the hosts, Limerick dictated matters for the closing quarter-hour. Following Alan Dempsey’s neat interception, Declan Hannon fired over a point that was the pick of Limerick’s bunch. That stroke gave Limerick a six-point lead at the break. Although Wexford gained the advantage of the elements after half-time, Limerick were first to threaten as David Dempsey bounded through and forced Mark Fanning to pull off a great save. While Wexford started to claw back with a trio of points, Peter Casey’s pointed free maintained Limerick’s lead of twelve-points-to-seven on 45 minutes. It was Wexford who bombarded the visitors from that point onwards. Lee Chin, Aidan Nolan and Barry Carton won puck-outs for the hosts and Davy Fitzgerald made some timely replacements, including Podge Doran, Harry Kehoe, and Nicky Kirwan. Elegant points from McDonald (two frees), Diarmuid O’Keefe and Harry Kehoe stirred Wexford retaliation before Podge Doran blasted over a 59th minute equaliser. Not even the sheeting rain could deter the home supporters from celebrating Lee Chin’s epic 60th minute effort that put Wexford ahead for the first time. Conor McDonald widened the gap to five with a quick-fire claim of 1-1. A closing Limerick brace of points could not undo the home-side’s sparkling finish as Wexford fans relished a cracking first-round league victory. Scorers for Wexford: Conor McDonald 1-8 (4fs, 1 65′), Lee Chin 0-2, Podge Doran 0-2, Harry Kehoe 0-1, Diarmuid O’Keefe 0-1. Scorers for Limerick: Peter Casey 0-5 (3fs), Graeme Mulcahy 0-2, John Fitzgibbon 0-1 (1f), Gearóid Hegarty 0-1, Cian Lynch 0-1, Paul Browne 0-1, Seamus Hickey 0-1, Declan Hannon 0-1, Diarmuid Byrnes 0-1 (1f). Subs: Podge Doran for A Maddock (41), Harry Kehoe for P Morris (47), Nicky Kirwan for D Redmond (56), Jack O’Connor for B Carton (71). Subs: (temp. Alan Dempsey for P Casey 30-34), John Fitzgibbon for J Ryan (44), Alan Dempsey for G Hegarty (47), Tom Morrissey for K Hayes (63), Pat Ryan for P Browne (64). This entry was posted on Sunday, February 12th, 2017 at 12:00 am and is filed under events, News, Videos. You can follow any responses to this entry through the RSS 2.0 feed. Both comments and pings are currently closed. Waterford defeated Kilkenny by 1-15 to 0-17 in Round 1 of the Allianz Hurling League Division 1A on Sunday February 12th at Nowlan Park Kilkenny. Patrick Curran’s first half goal proved to be the decisive score as Derek McGrath’s side got the better of the Cats at a bitterly-cold Nowlan Park, scoring their first win over Brian Cody’s side in Kilkenny since 2004. Waterford were up and running in the early stages, Pauric Mahony (2) and Conor Gleeson pushing their side 0-3 to 0-1 up inside the opening 10 minutes. T.J. Reid narrowed the gap with a pointed free, but the hosts were rocked when Curran broke through to blast his side into a strong lead when he gathered Tom Devine’s 12th minute pass and rattled the net (1-3 to 0-2). The goal proved to be the big score of the half, but a crucial part of Waterford’s display was Mahony’s accuracy from frees. He posted eight points in the first half from placed balls, a run which kept the Deise in front. T.J. Reid led the Kilkenny charge, grabbing six points in that opening half (five from frees), but Curran’s goal was a hurdle they couldn’t clear. Ollie Walsh sniped the last point of the half, but the Cats still trailed by four at the break (1-11 to 0-10). Waterford didn’t hang about in the second half, stretching their lead to six points thanks to early scores from Mahony and Jamie Barron. Kilkenny fought hard to narrow the gap, shooting the next four scores through T.J. Reid (0-3) and sub Walter Walsh, but they couldn’t get the goal they craved to reel in the long-time leaders. While Waterford endured something of a barren spell in the second half – they went 17 minutes without troubling the scoreboard operator – they did get back on track when Mahony and Barron put four points back between the sides late on. Still Kilkenny wouldn’t give up. Spurred on by frees from Reid and goalkeeper Eoin Murphy they battled on, making it a one-point game when Kieran Joyce fired over a good score following Richie Hogan’s injury-time pass, but the Deise held out to make a winning start to their League campaign. Scorers for Waterford: Pauric Mahony 0-10 (7fs, 265s); Patrick Curran 1-1; Jamie Barron 0-3; Conor Gleeson 0-1. Subs: Walter Walsh for Sean Morrissey (36), Paddy Deegan for Ollie Walsh (52), Richie Leahy for Pat Lyng (55), Shane Prendergast for Cillian Buckley (60), Conor Martin for Liam Blanchfield (70). WATERFORD: Ian O’Regan; Shane Fives, Barry Coughlan, Noel Connors; Tadhg de Burca, Stephen Daniels, Mikey Kearney; Jamie Barron, Conor Gleeson; Kevin Moran, Pauric Mahony, Michael Walsh; Patrick Curran, Tom Devine, Shane Bennett. Subs: Austin Gleeson for Mikey Kearney (52), Brian O’Halloran for Shane Bennett (55), Jake Dillon for Tom Devine (62), Gavin O’Brien for Patrick Curran (69), Shane McNulty for Stephen Daniels (70). Kildare defeated Cork by 1-14 to 1-8 in Round 2 of the Allianz Football League Division 2 on Sunday February 12th at Newbridge. Kildare continued their fine start to the league with an impressive six-point win at home against a disappointing Cork side. Behind by five at half-time, 8-3, Cork got back within two points with 15 minutes to go, but Kildare crushed any hopes of a comeback. In a stirring finish, they kicked five points to secure the win their performance deserved. While Kevin Feely was the conductor for Cian O’Neill’s side in midfield, Ben McCormack was the star man in attack and netted a superb goal in the 51st minute to crown another superb individual display. McCormack’s goal gave Kildare a seven-point cushion but Cork had their best spell in the next 10 minutes and when Luke Connolly’s long range effort deceived Mark Donnellan and dropped into the net, the Rebels had a lifeline. Kildare’s response was telling and they reeled off three points on the trot to put the result beyond doubt, cementing their place at the top of the table. On a bitterly cold afternoon in Newbridge, the home side gradually took control in the opening half and built a five-point cushion after 25 minutes in testing conditions. The wind chill was as much of a factor as the strength of the breeze and it was no surprise that it took 15 minutes for this contest to come to life.The elements did favour Kildare in the opening half but it was never as simple as shooting from long range. Both sides were reluctant to take on shots from distance and with six wides apiece in the opening half, their caution was understandable. Cork had the better of the early exchanges and held a strong defensive line across the middle. Although Kildare had the first score courtesy of Daniel Flynn, Cork moved ahead when Luke Connolly and Colm O’Neill pointed frees – O’Neill the instigator for both scores. Once Kildare got to grips with their opponents in midfield, the game turned in their favour. Kevin Feely was the lynchpin, winning a succession of marks and directing the play like a quarterback. He also chipped in with two points from play as Kildare won the primary battle. Corner forward Ben McCormack pointed his first effort of the game and he landed his second five minutes later. Feely’s brace gave Kildare a 7-2 lead after 25 minutes and at that stage, Cork had gone 15 minutes without a score. They were not short of chances though and two separate occasions, Ian Maguire came through from midfield to threaten the Kildare goal. Each time he came away empty handed and Cork were left to chew on a five-point deficit at the break. Kildare’s interval lead should have been greater and apart from six careless wides, Daniel Flynn was denied goal by a flying save from Ryan Price in the first minute. Overall, Kildare could only be thrilled with the outcome as they dispatched one of the leading teams in this Division with some ease. Scorers for Kildare: B McCormack 1-2, N Flynn 0-5 (3fs), K Feely 0-2, P Cribbin 0-2, D Flynn 0-1, T Moolick 0-1, C Healy 0-1 (f). Subs: Cathal McNally for Moolick (59); Chris Healy for Conway (63); David Slattery for McCormack (67); Peter Kelly for N Kelly (70); Shea Ryan for Feely, Black Card, (70); Conor Hartley for N Flynn (70). Subs: John O’Rourke for Powter (HT); Barry O’Driscoll for Dorman (51); Donncha O’Connor for Collins (52); John Mullins for Crowley (54); Donal Og Hodnett for Maguire (60); Brian O’Driscoll for O’Neill (68). Westmeath defeated Limerick by 1-18 to 0-12 in Round 2 of the Allianz Football League Division 4 on Sunday February 12th at the Gaelic Grounds Limerick. Shocked by a dropped home point against Carlow in the opening round, Westmeath got their Division Four campaign back on track when they notched up a comfortable nine-point win yesterday over Limerick in the Gaelic Grounds. Racing into a commanding position when skipper Ger Egan converted a penalty on the quarter-hour, they were never in any serious danger despite Limerick mounting brave rallies. With two defeats out of two, the home side have it all to do if they’re to make an immediate return to Division Three as they struggled once again to contain physically superior opponents. Westmeath made early use of the wind as Egan, Paul Sharry and David Lynch’s ‘45’ put them ahead before Brian Fanning got Limerick off the mark. However, the home side were struggling to cope with Westmeath’s running game which led Egan to convert a penalty after James Dolan was pulled down before John Egan stretched the gap to six. Limerick picked it up as the pressure on their defence eased off and, following Ger Egan’s reply to Darragh Tracey, pulled themselves back into contention as Jamie Lee sent over frees either side of Danny Neville. However, they weren’t getting the shot in quick enough and, after David Bryan saved off Lee, the Midlanders hit back through Sharry, Ger Egan and Kieran Martin before Lee’s third free left his side trailing 1-8 to 0-6 at half-time. Egan and John Heslin’s free increased Westmeath’s lead on the restart as did another Heslin free. However, Limerick again found a second wind with Lee’s free and Brian Donovan’s follow-up and, after Heslin responded, the gap was back to four as Seán McSweeney’s free was followed by a pair from Séamus O’Carroll. That was as close as they got. As Kelvin Reilly stuck the post, Johnny McCarthy picked up a second yellow and efforts from Heslin, Luke Loughlin, Shane Dempsey and Denis Glennon sealed the win for Westmeath. Scorers for Limerick: J Lee 0-4 (4f), D Tracey, S O’Carroll 0-2 each, B Fanning, D Neville, B Donovan, S McSweeney (f) 0-1 each. WESTMEATH: D Bryan; J Gonoud, K Maguire, M McCallon; J Dolan, F Boyle, D Lynch; P Holloway, G Egan; J Egan, P Sharry, D Corroon; K Martin, J Heslin, K Reilly.